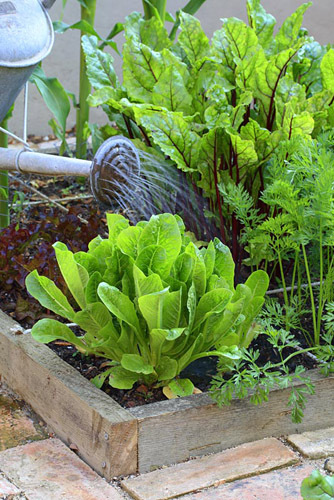 If you would love to grow your own fruit and veg but only have a small space to cultivate, try ‘square foot gardening’. Popularized by American gardener Mel Bartholomew in the 1980s, the practice uses organic gardening methods to grow vegetables in close proximity to one another, rather than in traditional rows, and in doing so, utilizes every inch of available space. To ensure this intensive cultivation method is successful, take time to prepare your soil before you start sowing. Dig in well-rotted farmyard manure or compost a few weeks before planting or sowing, which will condition and feed the soil, ensuring it retains nutrients well and drains easily. 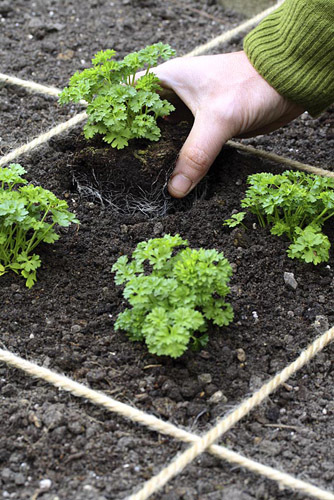 To create a square foot garden, divide up your plot into a grid of 12in x 12in (30cm) squares using canes or string – in a tiny plot you should be able to fit nine squares, but you can make more in larger gardens. Alternatively, set out your square foot grid in a raised bed on a patio or in a courtyard garden. A sunny site is best, but a garden in part shade can be successful if you select leafy crops that will grow well in these conditions. The small plot size means that you can tend all the plants without walking over the soil and compacting it, although in larger plots, construct a few narrow paths for access. 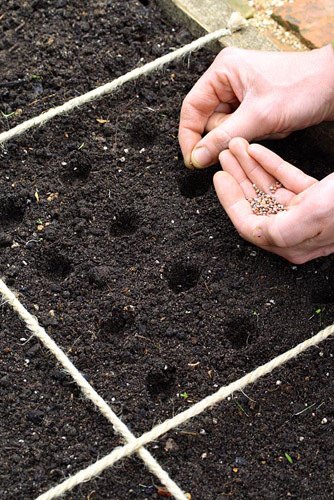 Plant one type of seed or young plant in each square, setting them out as closely as possible so that there will be no exposed soil between the mature crops. In his book, All New Square Foot Gardening, Mel recommends planting one large plant, such a broccoli, beans and tomatoes, per square, and four medium-sized plants, including lettuce, parsley, strawberries and chard. 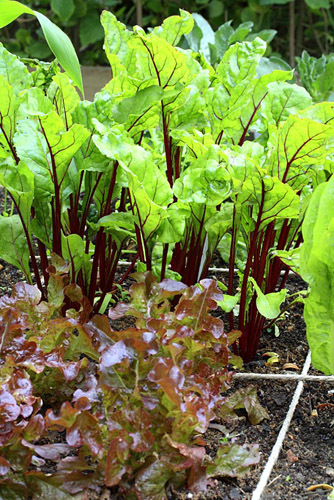 Plant nine small to medium-sized vegetables, like spinach and beetroot, in each square and 16 small plants, such as carrots, onions and radishes. For potatoes and other deep-rooted crops, create boxed sides to your squares with wood or slates. 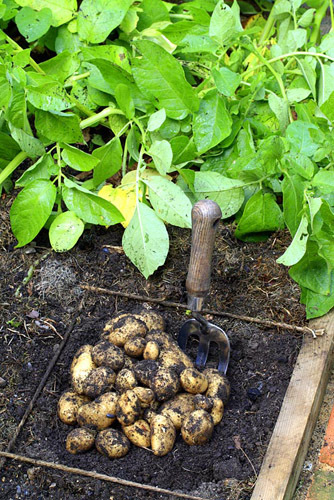 Plant potato tubers just below the surface at ground level, and as the plants grow, earth them up by covering the stems and leaves with soil, until you have filled the boxes. The potatoes will then continue to grow and should be ready to harvest when the plants flower, when you can remove the squares to reveal the tubers inside. 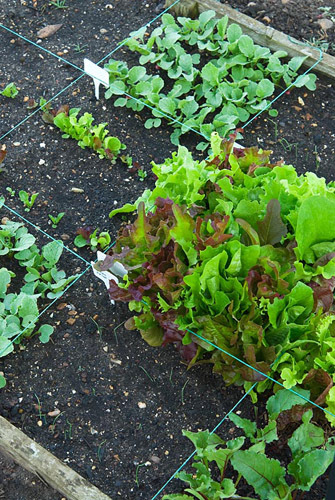 Plant different types of crop in adjacent squares to avoid a build-up of pests and diseases. Some gardeners also find that planting marigolds between crops helps to ward off some pests, while growing carrots in raised beds over 60cm (2ft) in height deters carrot fly (a low-flying pest). Alternatively, surround your carrots with a 60cm barrier of clear polythene. Your crops will need to be watered regularly, but you may find they require less moisture than those grown less intensively because the leaf cover helps to reduce surface evaporation. Try watering by hand to conserve water supplies and connect butts to your downpipes to capture rainwater. To prevent pest damage, cover brassicas with netting to guard against cabbage white butterflies, and cover ripening soft fruits to deter birds. 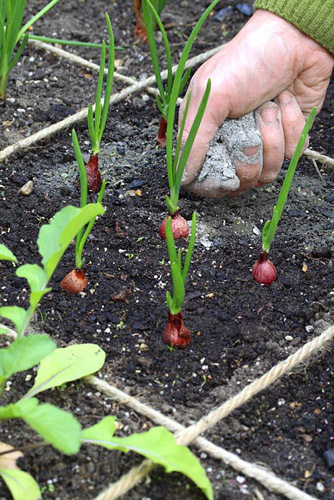 Most plants will not need extra fertilizer, but onions benefit from an application of potash as the bulbs start to form. Smothering the soil with plants helps to reduce weed growth, as the vegetable leaves shade the surface, thereby preventing them from germinating, but any that do make it through this defence should be removed promptly. 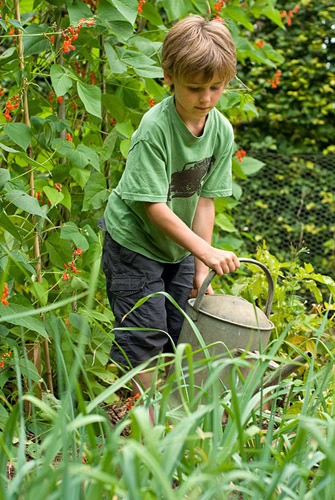 Support tall plants, such as beans and tomatoes, with sturdy canes, tying in the stems with twine as they grow. In the autumn or after you have harvested your crops, add a layer of well-rotted manure or compost over the surface, which will help to replace lost nutrients and condition the soil. This entry was posted in Expert advice, Practical gardening on April 29, 2014 by gapadmin. Getting out in the garden with kids is fun, whatever their age. They love digging holes or watering plants. 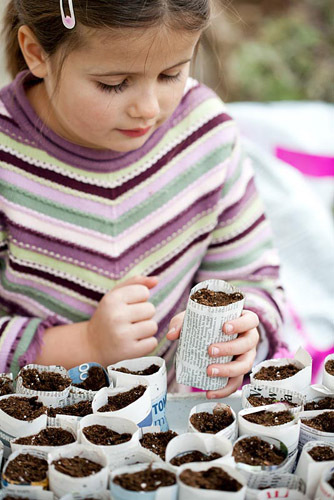 Planting seeds and watching them grow can seem like magic to children. 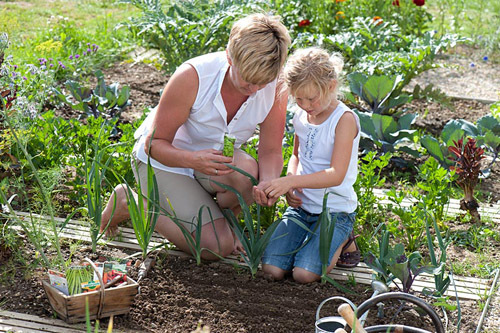 As well as being a lovely family activity, gardening with kids also means that you get to spend more time in the garden yourself which can’t be bad. There are some great ways to engage children and it’s a healthy and educational way to spend your time together. Start with a small project. Simple choices like mustard and cress or a gloriously tall and pleasingly fast growing sunflower that will enthral children. Think about growing food so they learn where it really comes from and what is possible. Fussy eaters may give different vegetables a try if they’ve been part of the growing and harvesting process. You don’t have to buy anything especially for children. Use your collected or saved seeds or cuttings from your existing plants. They can use your tools if supervised – a trowel is a good size for small hands. 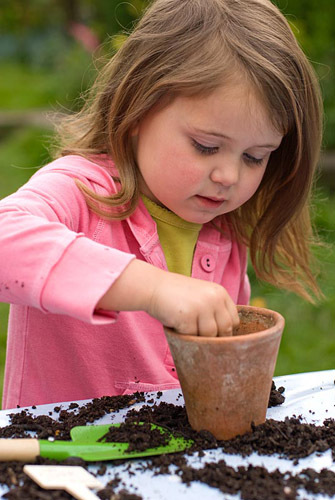 Gardening together is also a very good way to educate children about recycling and composting. They can have their own compost bin and you can make it fun drawing pictures of food and waste that can go into it. Make simple biodegradable pots for planting their seeds in using old newspaper. 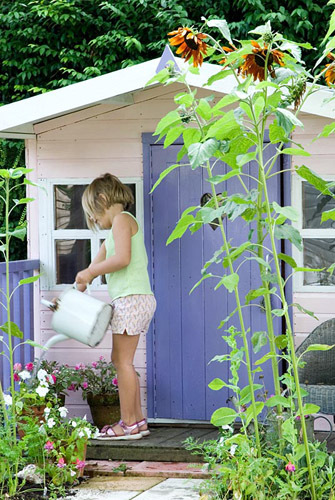 If your child does show an interest you could allocate a small area, containers or entire bed for them to grow their own garden. And if they do really love it , you will be passing on a set of skills that they can use throughout their lives. This entry was posted in Practical gardening on April 25, 2014 by gapadmin. Liven up your garden instantly with annuals. Called annuals because they complete their life cycle in one season – many are hardy, simple to grow and add stunning colour to your garden without fuss. There are many benefits to the temporary nature of annuals and a huge variety available. Great for filling gaps in a perennial border or even helping you to decide on a colour scheme without commitment in a new flowerbed or garden. You can sow many annuals directly where you want them to grow in spring and enjoy them throughout the summer months. Some annuals make colourful companion plants in vegetable beds. 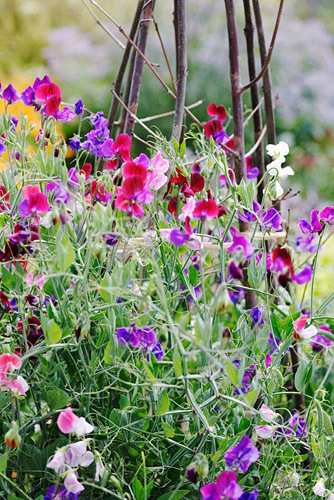 For a quick lift plant climbing sweet peas – these fast growing, scented plants make lovely cut flowers. Plant the plugs or seeds in a flowerbed with a wigwam or canes and watch them grow. 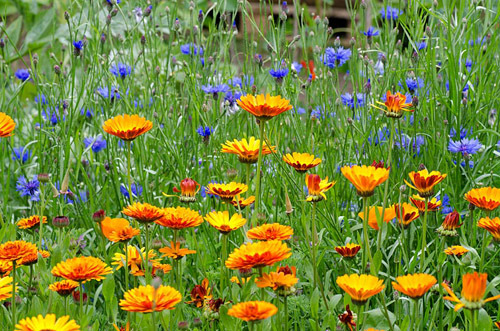 Annuals can be used for mass planting or bought in mixes to produce a summer meadow in your garden, large or small. Colourful and great for wildlife. Not only can annuals bring colour to your garden, they can brighten your home too. 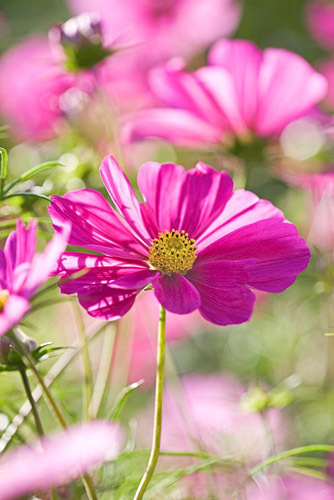 Some make lovely cut flowers – Cosmos have lovely long stems and cutting and deadheading will prelong flowering. 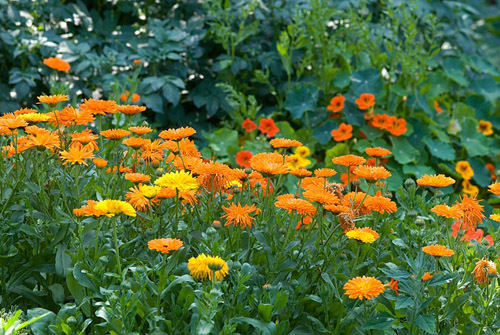 The strong colour of calendulas attracts hoverflies, lacewings and ladybirds. Bringing in good insects rather than repelling the bad will in turn help keep the aphid numbers down and they look great. This entry was posted in Seasonal, Spring on April 22, 2014 by gapadmin.